After hearing the fantastic Hotel America from the Szilárd Mezei Vocal Ensemble earlier this year I was quick to pick up these two live albums by his septet released by FMR shortly after. 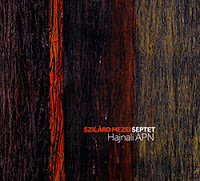 Formed in 2005 the Szilárd Mezei Septet is an evolution of Mezei’s quintet of double bassist Ervin Malina, percussionist István Csík (Malina and Csík are also in Mezei's trio), reedsman Bogdan Rankovic, and pianist Milan Aleksic. Here the quintet is augmented with trombonist Branislav Aksin, flautist Andrea Berendika (on Hajnali APN), and vibraphonist Ivan Burka (on Véres Páncál), with pianist Mate Pozsar replacing Aleksic. All are incredibly capable and professional players that seem telepathically syncopated to the Vojvodinian composer and violist’s ambitions (no doubt a sign of rigorous rehearsal and touring). The pieces themselves are organized frameworks adorned with themes, solos, and sections of group free play. 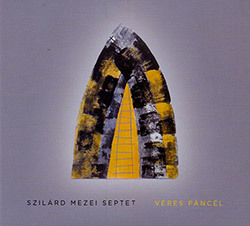 There are elements of free jazz and classical as well as archaic Hungarian folk music à la Béla Bartók, a named influence and fellow countryman of Mezei. One of the many things I really value about the septet’s music is their attention to the flow of the piece and their respect for it. The soloists dedicate themselves to working within Mezei’s framework and it yields spectacular results, especially in the semi-composed group free play sections. 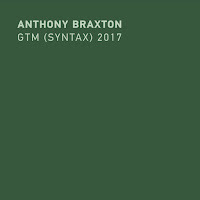 Similar to another of his influences, Anthony Braxton, the solos follow a trajectory, diverging into free play and then converging back again at some pre-determined note or phrase. This results in the instrumentalists imparting their own crux to the piece, allowing for a mosaic-like expression from the group focused through Mezei’s compositional lens. To say that this works well is an understatement, and as soon as I had absorbed these two albums I got the rest of the septet’s albums in short order. Hep 12 opens the set with honking brass and woodwinds beneath which a ponderous piano riff swells. The horns thrum up some drama for Pozsar’s fantastic piano solo over Malina’s quarter notes. The dramatic theme of the intro is superimposed intermittently, providing a complex counterpoint to the melody. Aksin slinks in alongside Pozsar for a trombone-piano dual, riffing off each other until everyone drops out but Aksin which starts a period of group free play. The transition from the composition to the free playing section is subtle, and the septet plays off, over, and around each other, reaching several crescendos with the percussion boosting the intensity. Berendika’s playing is much more prominent here, her icy runs of treble frosting the outlines of the group play. This is followed by a transition to a more spacious arrangement structured over Malina’s thrumming bass line and driving horns with accents of flute and Mezei’s viola. The soloists are given ample room to be creative and they in turn provide fiery playing and inventiveness. Bogdan Rankovic solos on alto, trading brisk runs and dark shapes with a wide accentuating vibrato. This is followed by a brief solo from Aksin, then a reprise of the previous theme and a brief solo from Csík. The septet then returns to the fantastic main theme to close the song. The rollicking, rhythmic Hattyuk/Swans begins with an uneven piano figure with which the horns, strings, and flute provide counterpoint. The song then breaks down into a segment of brilliant free play, very suddenly this time, like a handful of marbles hitting the floor and scattering. 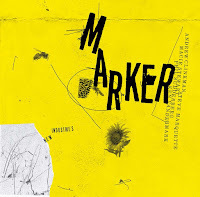 Malina rips off grainy arco over which the ensemble takes turns flitting to the fore, providing a timbral bouquet that unhurriedly slows in pace and becomes more introspective. Csík honks and growls on his trombone, eliciting brusque responses from the viola, flute, bass clarinet, and drums that color the space like an expressionist painting. The septet then goes into a vivid section of moody interplay (both structured and improvised if my ears don’t deceive me) as a set-up for the arrival of the leitmotif. 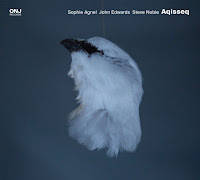 The monolithic title track Hajnali APN starts with a brief set-up from the horns, viola, and drums before the brilliantly dramatic piano ostinato rolls in supplying a sense of motion and capturing the septet in its gravity. 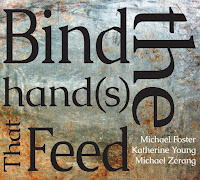 The horns and viola play complex and angular counterpoint to the piano, ratcheting up the drama. Csík solos first, alternating dulcet glissando with rattling honks and vocalizations. Mezei is next; his virtuosic arco provides so much of the ‘folk’ element to his groups. Rankovic then solos on bass clarinet, alternating plump Dolphy-like low end bluster with squealing altissimo. Berendika swells into the mix with her airy rolled notes and percussive tonguing providing a sunnier shade to the piece. The song then abruptly wanders in another direction, the piano playing a rollicking figure before dropping out and leaving Malina for an extended solo over the minimal percussive structure provided by Csík. Pozsar joins Malina and the two provide an interlude of piano flash and Gary Peacock-like pizzicato before the return of the piano figure and then a reprise of the main theme. Documenting a 2018 set by the Septet in Serbia, Véres Páncál starts off with 98%, originally from the album Polar which consists of a group free play wind-up into a 3 count piano figure over which the septet provides a brief third stream dialogue. It shifts (as it does on the album) right into the song Polar, here accorded a bit of a different sound due to the inclusion of Ivan Burka on vibraphone. 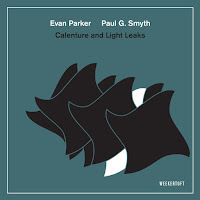 It gives the pointed arrangement a more playful tone and nicely complements the piano and bass clarinet. Subnormal Slap is next with a loping figure before a looser segment led by Mezei’s pizzicato viola and the bell-like vibraphone of Burka. The piece is very dramatic and orchestral, punctuated with percussion and vibes. It’s so cohesive that it’s difficult sometimes to tell what is improvised and what is not. This is followed by the absolutely brilliant Innen/From Here, featuring the mournful viola of Mezei and the deep arco of Csík stating the refrain before the horns take over and sweep you away with melancholy. Mezei’s solo here is absolutely stunning, his absolute mastery on display in shifting descants and roiling crescendos. Rankovic follows with a whirlwind solo on alto ending in breathy notes over which the viola and contrabass reengage for a reprise of the opening sequence as the piano ripples and undulates with regenerating glissando. The piece begins with a staggered theme of horns and contrabass which then shifts to the piano shortly before the septet rejoins. The piece has a tense feel as it uneasily skims along. Mezei delivers an jagged solo on viola, alternating between aggressiveness and subtlety. 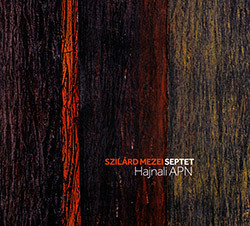 Pozsar offers a response solo on piano every bit as jagged as Mezei’s bow, as if the two are sparring. There is a short intermezzo of contrabass, followed by the return of the main theme on the piano, with the horns providing counterpoint before the piano joins their melody. This is then turned inside out over the final minute, the septet providing a plethora of variation and embellishment before ending in an unexpected whisper. Next, Became Grey states its theme of lamenting piano, strings, and bass clarinet. The shortest piece of the set it comes and goes entirely too quickly, its loveliness a welcome interlude. The last two pieces are also selections from Polar, starting with Hep 22 which exudes a playful quality with its vibraphone heavy Dolphy-esque swing. The album closes with So No from Polar, a brisk number of deft orchestration and dexterous playing by the septet. Szilard is a fascinating player/composer and a warm and generous human being. Fans of innovative musics in North America - of which I am one - need to wake up to this dude's music. Thanks for the comments! Szilard is an amazing individual indeed, his music is unique and sophisticated and it sticks with you long after you listen. I agree North America has been slow to catch on.